After both his parents died in an accident, Tsugawa Tatsuya is now left with millions of heritage he can't use. In the weeks after, he's still mourning and thinking about his father's last words, "Tsugawa family's man must be a man of great vessel". But Tatsuya is not confident he can fulfill his father's last wish. One day, he met Miyazaki Seine, a strange girl who seems to enjoy being bullied. Tatsuya believes he can help her even though his friends only see her as a masochist pervert, and Seine herself told him to mind his own business. Seine hunts creatures of the sea, a kind of parasitic bug that controls humans and influences them to do hateful things. She possesses an immortal body and a beast called AiON that's used to lure and devour the bugs from inside the human host. She and the bugs naturally have an impulse to kill each other on contact. Even so, Tatsuya still can't just leave her alone, he wants to help her. 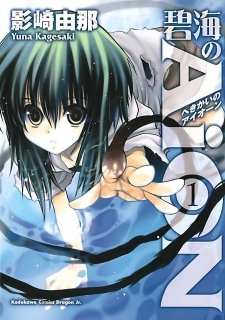 Hekikai no AiON was published in English as AiON by Tokyopop with 3 volumes released from December 28, 2010 to June 29, 2011 before the publisher went defunct. VIZ Media digitally rereleased 2 of the Tokyopop volumes under the VIZ Select imprint from June 30, 2015 to July 28, 2015. A creator can come up with an interesting premise, and unique characters, but it all comes down to how does one execute them, and this series comes off a bit like a sophomore production than an actual full on executed story. STORY: Hekikai no Aion is the latest series from Yuna Kagesaki, the creator of Chibi Vampire (Karin), which has a very interesting premise: where sea creatures like mermaids and mind controlling parasites duke it out against a strange and seemingly immortal young girl. But the story is about a high school boy named Tatsuya Tsugawa, who had lost both of his parents in a car accident and now has other family members taking care of him, though he is quite rich and is well off financially due to an inheritance, he is still in a mourning phase and clings to his fathers dying wish for him to become an upstanding man. But hey, he's not all depressed and acting all emotional, thanks to him clinging to his fathers wish, he comes off as Mr nice guy, and meets the strange main female lead, Seine Miyazaki, who curiously gets unmercifully bullied quite often with Tatsuya trying to rush in at times to help, but Seine treats it as him getting in her way. As little did he know that the bullying Seine puts up with is intentional and eventually his meddling gets him involved in a war Between Seine and creatures of the sea. Like I mentioned earlier, the premise is intriguing and is quite commendable for the creator to come up with yet another interesting series (As you know or not know, her first series was about a reverse vampire). But the initial reaction quickly wears off as the plot setups, character development and interaction end up predictable, typical, and lacking in some aspects. Tatsuya is a likable male lead, and Seine is unique, but where does their relationship end up? The romantic comedy route, just like the creators last series. The series take on mini arc story progress with Seine having to fight mind controlled humans usually people who are related to Tatsuya in some way (Families, friends, etc) and uses a snake like creature to devour the person infected with the parasite whole (Don't worry, the creature quickly spits out the victim after it removes the parasite), and these arcs are the meat of the story, but in between are the slice of not-ordinary-life-anymore moments introducing other characters like Tatsuya's friends and the strange twins that are related to Seine in some way. Tatsuya's friends are nothing special and not worth talking about. And the absurdly quirky twins would of become interesting if not that they remained in irritating vagueness. Some are going to feel a bit drowned in typical cliches, but overall, the manga still manage to keep some unique elements interesting, but the progress is disappointing compared to the premise. ART: Arguably, the creator displays better artwork than what was contained in her previous series and has gotten better at in a stylistic point of view, but at the same, seemed to have gotten sloppy with the anatomy of the characters and the hair styles are all over the place, but the color art looks great. The character designs more or less range from good to bland, but a little more at the later. - Story telling doesn't live up to it's unique premise. - Too much unnecessary attention to the support cast. - Too vague on some aspects and characters. - Comes off typical, not different from anything you've seen. Who knows? Maybe the story becomes better, and maybe this series becomes a hidden treasure later on, but for the moment, it doesn't seem to have what it takes. I apologize in advance for not making a good review. I'm not sure if I'm a good reviewer, but enjoy just making reviews. First of all, the story is about the main girl, Miyazaki (or Seine) trying to avenge his guardian from mermaids, which isn't the mermaids we usually imagine. But she also has a job of taking out "mushi"(Bugs that take over someone's thoughts by the mermaids desires), but in order to do so, she must die at least once, meaning she's immortal. But meeting a guy name Tsugawa makes it difficult for her to do her job, because he doesn't want her to die. The story so far is great. The development of the story is going in a good pace that everyone can catch on. The art will remind you of Karin (I think they're the same artists), which is pretty good in my opinion. The characters make the story better. Seine reminds me of Yuki Nagato for some reason, but that's not the point. The development of the characters are going in good pace. Especially after they are taken over. They show they're true selves afterwards. It's easy to enjoy the series because of its random comedies but also has serious action and some drama. Overall, I enjoy the series so far. I hope you find this review at least okay.